Ernest Rutherford is the father of nuclear chemistry and nuclear physics. He discovered and named the atomic nucleus, the proton, the alpha particle, and the beta particle. He discovered the concept of nuclear half-lives and achieved the first deliberate transformation of one element into another, fulfilling one of the ancient passions of the alchemists. 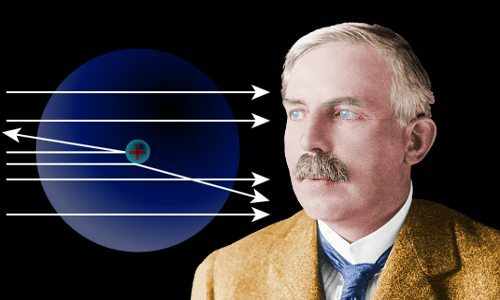 Ernest Rutherford was born on August 30, 1871, in the village of Brightwater on New Zealand’s South Island. His father, James Rutherford, was a farmer from Scotland and his mother, Martha Thompson, was a schoolteacher from England. Ernest was the fourth of the 12 children his parents brought up in New Zealand, and he was blessed with both high intelligence and a talent for sports, particularly rugby football. He read his first science book at the age of 10, and was enthralled by what he learned, carefully performing the experiments the book suggested. He attended high school at Nelson College in the small town of Nelson, where his boarding fees were funded by a scholarship. At age 18 he left for the city of Christchurch on a scholarship to Canterbury College, now the University of Canterbury. In 1893 he graduated with first class honors in both mathematics and physical science. In 1895 he obtained a bachelor’s degree in chemistry and geology from Canterbury College and spent a short time working as a schoolteacher. He won an overseas study scholarship and decided to go to the University of Cambridge in the United Kingdom to work in J. J. Thomson’s laboratory. Rutherford arrived in Cambridge in 1895, age 24, where he was made to feel very welcome by J. J. Thomson and his wife Rose. Rutherford had already invented a radio receiver in New Zealand. He improved it at Cambridge, where he built a world-record-breaking receiver capable of detecting radio waves at half-a-mile. However, the battle to develop radio was one he would quickly lose to Guglielmo Marconi. Rutherford did not mind in the least. His radio work was not as intellectually stimulating as other work he was doing on radioactivity and the effects of X-rays on gases. Rutherford’s research work was remarkably advanced, impressing Thomson enormously. In 1898, when a chair in physics came up at Montreal’s McGill University, Thomson recommended Rutherford should be appointed to it. In 1898 Rutherford sailed to Canada where, age 27, he became a professor. At McGill he carried out the work that led to his 1908 Nobel Prize in Chemistry. In 1907, after nine years at McGill, Rutherford sailed back to the UK to take the University of Manchester’s Chair of Physics. Rutherford’s final move came in 1919 when J. J. Thomson retired. Rutherford, now age 48, replaced Thomson as the Cavendish Professor of Experimental Physics at Cambridge. Starting in 1898 Rutherford studied the radiation emitted by uranium. He discovered two different types of radiation, which he named alpha and beta. Rutherford began his investigation of alpha and beta radiation in the same year that Pierre and Marie Curie discovered the new radioactive elements polonium and radium. In 1907 Rutherford discovered that radioactive elements have half-lives – he coined the term half-life period to identify the phenomenon. Rutherford realized that Earth’s helium supply is largely produced by the decay of radioactive elements. He devised a method of dating rocks relating their age to the amount of helium present in them. Based on the fact that our planet is still volcanically active, Lord Kelvin had indicated Earth’s age could be no greater than 400 million years old. He said Earth could be older than this only if some new source of energy could be found that was heating it internally. Rutherford identified the new source – the energy released by radioactive decay of elements. He also began the science of radiometric dating – using the products of radioactive decay to find out how old things are. After his move to the University of Manchester, Rutherford and two of his researchers – Hans Geiger and Ernest Marsden – carried out in 1909 one of the landmark experiments in science – the gold foil experiment. Rutherford began the experiment because he was puzzled that fewer alpha particles than expected from a sample of radium were reaching a new detector in his laboratory. The only medium the particles had to travel through was a small amount of air. Rutherford thought the huge amount of energy carried by alpha particles should have allowed them to travel through a small amount of air undisturbed, with no deflection. He gave Geiger and Marsden the task of investigating to what extent alpha particles would be deflected from their usual straight-line path by passing through a very thin sheet of gold foil. Geiger and Marsden used a sample of radium to provide a stream of alpha particles which passed through the gold foil. Where the alpha particles ended up was recorded electrically. The results were remarkable. If gold were a smooth substance on the atomic scale, as it had been thought to be, a slight deflection of alpha particles would have been expected. In fact, most alpha particles shot straight through the gold without deflection, but a few were deflected enormously, some even ‘bouncing’ straight back from the gold. Rutherford was utterly amazed by this. Famously, he likened it to firing a battleship’s guns at tissue paper and discovering some of the shells were bouncing back from the tissue paper. Rutherford explained the effect by proposing a new model for the atom, replacing the plum pudding model of his old mentor J. J. Thomson. His new model required atoms to have a small, very dense core. With this step, guided by his experimental data, Rutherford had discovered the atomic nucleus. J. J. Thomson had modeled the atom as a sphere in which positive charge and mass were evenly spread. 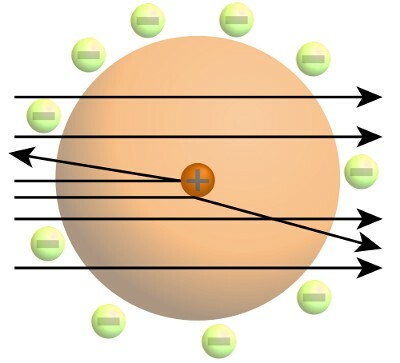 Electrons orbited within the positive sphere. This was called the plum pudding model. The results of the gold foil experiment allowed Rutherford to build a more accurate model of the atom, in which nearly all of the mass was concentrated in a tiny, dense nucleus. Most of the atom’s volume was empty space. The nucleus was like a fly floating in a football stadium – remembering of course that the fly was much heavier than the stadium! Electrons orbited at some distance from the nucleus. This was called the Rutherford model. It resembles planets orbiting a star. Although Rutherford had received a Nobel Prize for his earlier work, his discovery of the atomic nucleus was probably his greatest achievement. A 26-year-old Niels Bohr, who was spending time as a research student in Rutherford’s laboratory in 1912, was intrigued by Rutherford’s model of the atom. He could see that in terms of classical physics, the separation of charge into positive nucleus and orbiting electrons was unstable. He explored the implications of such an atom, leading directly to the first quantum model of the atom – the Rutherford-Bohr atom. Rutherford and Bohr became the best of friends; they and their wives often vacationed together in later years. When he found hydrogen produced in the nuclear reaction above, Rutherford began to suspect that the hydrogen nucleus may actually be a fundamental particle, a building block of all atomic nuclei. Rutherford carried out calculations of the stability of atomic nuclei. 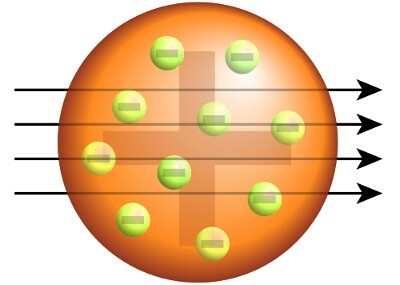 He found that unless some neutral particle were added to the nucleus, the repulsion of the positively charged protons would cause nuclei to fly apart. In 1920 he named this hypothetical particle the neutron. James Chadwick, Rutherford’s Assistant Director of Research, discovered the neutron in 1932, proving its existence by experiment. Rutherford did not exactly conform to the scientific stereotype. He was a direct, no-nonsense man, who spoke his mind. He was not overly concerned with his appearance; some people mistook the great scientist for a farmer! He was well-known for his limitless reserves of energy and enthusiasm, which left a number of his workers exhausted. In summer 1900, two years after moving to Montreal, Rutherford sailed for New Zealand to marry Mary Georgina Newton, whom he had become engaged to while living in Christchurch. They had one child, Eileen Mary, born in 1901. When she was 20, Eileen married the renowned physicist Ralph H. Fowler. Eileen died in 1930, nine days after giving birth to her fourth child. Rutherford and his wife outlived their daughter, taking solace in their grandchildren, all of whom became academics. Rutherford visited his research workers daily, critical or praising of their work, listening to their problems, making suggestions. He could be blunt when he thought people were doing things wrongly, but his workers revered him because they knew that above all else Rutherford was pushing hard on the frontiers of human knowledge and he always gave them full credit for their research. Rutherford was an inspiring man and, as had been the case with J. J. Thomson, an unusually large number of his research workers went on to win Nobel Prizes, including James Chadwick, George de Hevesy, John Cockcroft, Ernest Walton, Pyotr Kapitsa, Cecil Powell, Niels Bohr, Otto Hahn, Frederick Soddy, and Edward Appleton. During his lifetime, Rutherford received many honors. In addition to his Nobel Prize, he was knighted in 1914, becoming Sir Ernest Rutherford, and then made a British lord, receiving the title Baron Rutherford of Nelson in 1931. Ernest Rutherford died age 66 of intestinal paralysis on October 19, 1937. His ashes were buried in the Nave of Westminster Abbey, joining other science greats such as Isaac Newton, Lord Kelvin, Charles Darwin, and Charles Lyell. In 1940 the ashes of his friend and former boss J. J. Thomson were laid to rest with Rutherford and the other scientists. Element 104 is named Rutherfordium in his honor. "Ernest Rutherford." Famous Scientists. famousscientists.org. 30 Jul. 2015. Web.